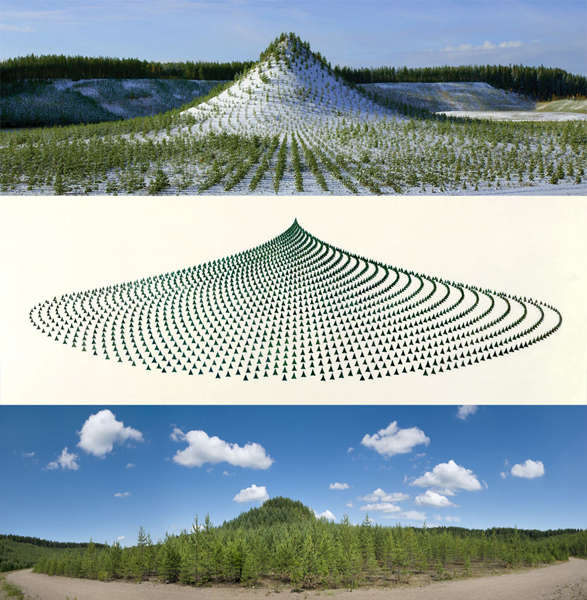 A huge manmade mountain measuring 420 meters long, 270 meters wide, 38 meters high and elliptical in shape was planted with eleven thousand trees by eleven thousand people from all over the world at the Pinziö gravel pits near Ylöjärvi, Finland, as part of a massive earthwork and land reclamation project by environmental artist Agnes Denes. The project was officially announced by the Finnish government at the Earth Summit in Rio de Janeiro on Earth Environment Day, June 5, l992, as Finland's contribution to help alleviate the world's ecological stress. Sponsored by the United Nations Environment Program and the Finnish Ministry of the Environment, Tree Mountain is protected land to be maintained for four centuries, eventually creating a virgin forest. The trees are planted in an intricate mathematical pattern derived from a combination of the golden section and the pineapple/sunflower system designed by the artist. Even though infinitely more complex, it is reminiscent of ancient earth patterns. Tree Mountain is the largest monument on earth that is international in scope, unparalleled in duration, and not dedicated to the human ego, but to benefit future generations with a meaningful legacy. People who planted the trees received certificates acknowledging them as custodians of the trees. The certificate is an inheritable document valid for twenty or more generations in the future – the first such document involving the future in human history. The project is innovative nationally and worldwide—the first such document in human history. This is the very first time in Finland and among the first ones in the world when an artist restores environmental damage with ecological art planned for this and future generations. Tree Mountain, conceived in 1982, affirms humanity's commitment to the future well being of ecological, social and cultural life on the planet. It is designed to unite the human intellect with the majesty of nature. Tree Mountain was dedicated in June, 1996 by the President of Finland, other heads of state, and people from everywhere.